Tetlow King Planning (TKP) successfully obtained permission for 165 dwellings, touring caravan park including facilities building and cafe, sports pitches and changing facilities and ecological enhancement areas at the former Wall Park Holiday Centre, Brixham, Devon. 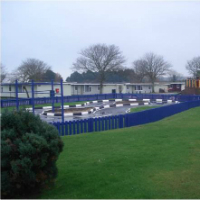 The site was a former holiday camp containing run down chalets and play facilities. The site was in the Devon AONB and the European Protected Special Area of Conservation was nearby in relation to the habitat of the Greater Horseshoe Bats at Berry Head. The planning application for the redevelopment was therefore subject to an Environmental Impact Assessment and an Appropriate Assessment under the Habitat Regulations. The initial scheme for 219 dwellings and a 60 bed care home was initially recommended for approval however it was refused by the Council and dismissed on appeal, with the Inspector considering the exceptional circumstances required for development in the AONB did not apply. TKP worked with Torbay Council and Brixham Neighbourhood Forum over a number of years to obtain a scheme which met the needs of the local community, including the rugby club, and was identified for housing in the adopted neighbourhood plan. The Council appreciated accepted the arguments by Tetlow King Planning that this revised scheme met the requirements of paragraph 116 of the NPPF. The proposal would also result in ecological and recreational enhancements to the area as well as providing much needed housing. The revised scheme with fewer dwellings and tourism and leisure facilities was approved by the Council and TKP continues to advise on any issues with the reserved matters applications.